Common in the alpine meadows of the N. Cascades. Associated with alpine grasses such as; altai fescue, mountain sagewort, bellard's kobresia, alpine sweetgrass, one-headed pussytoes, mountain harebell, glaucous gentian, spiked woodrush, diverse-leaved cinquefoil and small-awned sedge. 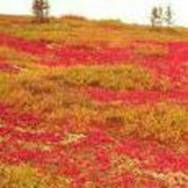 Associated with some dwarf shrubs such as; four-angled mountain-heather, dwarf snow willow, polar willow, white mountain-heather, mountain-avens, bog blueberry, partridgefoot and lingonberry. Also associated with various mosses and lichens including; awned haircap moss, broom moss, common coral, as well as, Cetraria, Cladonia and Peltigera lichens. Grows as a shrub that rarely exceeds more than 60 centimeters in height and forms dense mats. 2. Baskin, Carol C.; Baskin, Jerry M. 2002. Propagation protocol for production of container Salix arctica Pall. plants; University of Kentucky, Lexington, Kentucky. In: Native Plant Network. URL: http://www.nativeplantnetwork.org (accessed 26 April 2005). Moscow (ID): University of Idaho, College of Natural Resources, Forest Research Nursery. http://www.nativeplantnetwork.org/network/view.asp?protocol_id=169,1450. 3. Evans, Jeff. 2001. 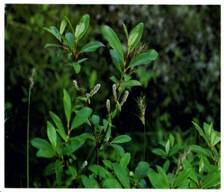 Propagation protocol for vegetative production of container Salix arctica Pall. plants (800 ml containers); Glacier National Park, West Glacier, Montana. In: Native Plant Network. URL: http://www.nativeplantnetwork.org (accessed 26 April 2005). Moscow (ID): University of Idaho, College of Natural Resources, Forest Research Nursery. 5. Standards for broad terrestrial ecosystem classification and mapping for British Columbia found at http://srmwww.gov.bc.ca/risc/pubs/teecolo/bei/bei_1998.htm#p4_0.